This image could have used more exposure time...maybe 5 minutes more? Maybe even more than that. Reciprocity in low light with paper is hard to guess. I like the foggy atmosphere, though. Anyway, picassocam dutifully stayed there at the jury box, making this image, while D and I ran around the courthouse photographing other things. 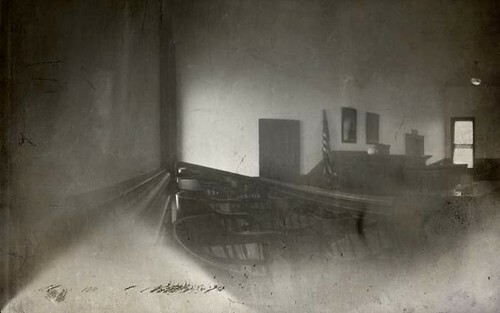 The courtroom was used from the 1880s through the 1920s, before the Cochise County seat was moved to Bisbee, about 20 miles away. D Stewart PDX came down to my area to photograph, and we had a girls' day out! We pinholed all over Cochise County, Arizona, in the driving snow (flurries) and icy cold wind! We even traded cameras for the day, so I got to shoot a roll of film in her Terminator 3 pinhole camera! Between us, I think we used 5 pinhole cameras this day. Thanks D, for a wonderful adventure with you! This image concludes my series of photographic adventures with D.
Image made February 27, 2011.